by Robert A. Burt. Cambridge: Harvard University Press, 2012. 400pp. Cloth $29.95. ISBN: 9780674065666. Reviewed by Jeffrey Polet. Department of Political Science, Hope College. Email: polet [at] hope.edu. The idea that God might require our forgiveness seems to turn traditional theology on its ear. Does this suggest God is less than perfect? Less than all-powerful? Himself subject to a law which binds God and humanity alike by its terms? If God, as Augustine says in Book I of The Confessions, “made us for [him]self,” we are to ask why God felt the need to do so. Was there a deficiency in God that could only be filled by creating humanity? And, if so, would this new creature be capable of satisfying that divine need? If not, wouldn’t this set the stage for a cycle of desperate reaching, disappointment, and tenuous reconciliation between God and humanity? The dominant theology of Western Christianity – classical theism – emphasizes the eternity, simplicity, ultimacy, and impassability of God. For those raised on such ideas the questions in the preceding paragraph will no doubt be troubling ones, for they suggest God’s limitations. Robert Burt, Alexander Bickel Professor of Law at Yale Law School, fearlessly takes up these questions and more in In the Whirlwind. The book emerges out of a dozen-plus years of careful reading of the Bible, and even though Burt disclaims any pretense to being a Biblical scholar, the book bristles with acute insights. The central tenet of In the Whirlwind is that the Hebrew and Christian scripture presents us with a very ambiguous picture of God, and a picture of human beings that presents them as simultaneously weak and noble. Departing from Augustine, who after observing that God made us for himself but then followed it by saying that even though God was searching it implied “no lacking” and God’s repentance implied “no regret,” Burt wants to argue that God created humanity both to assert His power over the primordial chaos and to rectify His loneliness. The first creation account in the book of Genesis shows God and humanity in harmony with each other, but already the second creation [*104] account shows deficiencies in the relationship between Adam and God. Indeed, the accounts in Genesis establish the truth that “God is unable to exert definitive control over the universe” and is reluctant to admit it. 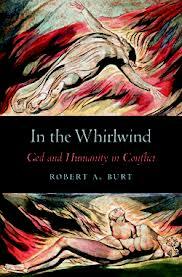 Nowhere, argues Burt, does God’s limitations become more apparent than in his dealings with humanity. Here Burt focuses on five key figures of the Hebrew scripture: Adam, Noah, Abraham, Moses, and Job. In the stories of these figures we see the disruption of harmony between God and human beings, God’s frustration with humanity’s unwillingness to remain fully engaged with him, and humanity’s frustration with a God who seems jealous, angry, and constantly on the verge of destroying His own creation. This dynamic leads to a central thesis of the book: that the biblical text provides us with the narrative unfolding of substantive standards by which human beings can judge divine conduct, and that such standards lead to the development of different models of authority. God creates the dilemma for himself by creating a being who has power over God: namely, in man’s ability to withhold reciprocal affection. The whole creation account demonstrates, says Burt, that in many ways God needs us more than we need him. As a result, God relates to humanity via the contradictory goals of being in a relationship while at the same time trying to maintain undiminished power for himself. However, to be in a relationship is to have diminished power, for the other party can always opt out. This leaves God with the choice of destroying that which he has created or subordinating his power to the demands of the relationship. Once God engages in such subordination, humanity now has the power to demand that God live up to the requirements of relational living. In the process of making God accountable, we see the development of the ways in which God exercises his authority over human beings. In the story of Noah we see that God commands compliance largely through fear, while with Abraham God’s authority operates on the basis of rewards. In the process God sets down terms by which human beings will be able to hold God accountable, and there emerges in the process two different modes of authority: the “command-and-punish” mode and the “rainbow” mode. Burt clearly argues that the former mode is inherently deficient for the simple reason that one can no more command love than one can coerce faith. As a result God has to place himself under the restrictions of a “rainbow” mode of authority that will recognize the inherent limitations of all relationships and move regret, repentance, and forgiveness to the foreground. The contours of this mode of authority make themselves present in the Moses narrative, where Moses on Mount Sinai presumed to act as a “mnemonic rainbow” for God: to act as God’s conscience, as it were. This kind of intimacy is what allowed Moses to say at the last that love rather than obedience is the proper response to God. The argument achieves its dramatic apogee in Burt’s reading of Job. Here the dynamics of human suffering, God’s need to know that we love him, and the incommensurability of God’s needs and our own, are articulated with unmatched [*105] clarity in Job’s demanding an accounting of God and God’s admission of guilt in testing Job so brutally. The depth of the breach between God and Job requires a new mode of reparation: mutual forgiveness. Burt argues that justice is not an essential characteristic of God; rather, God is defined by his need to have a relationship with humanity that is predicated on more than power or the terror power produces. Instead, we relate through mutual respect, loyalty, and love. “This courage to transcend disappointment and mistrust [for how could Job trust God after God let Satan loose on him? ]” writes Burt, “and to renew and even deepen loving relationships is the core virtue in the political theory underlying the Bible” (p.175). This means that the relationships undergirding any theory of authority are necessarily unreliable, which means that authority itself will and must be always unstable. Harmony always leads to rupture and rupture always requires forgiveness. Forgiveness, however, cannot be commanded – it can only be freely given. It is, in short, a gift, which is the central epiphany of the Christian gospels. Jesus recognized that the key to the rupture between God and humanity was mistrust, and that such mistrust could not be repaired by command, but only by “a consensual pledge on both sides”(p.211). In that sense, Christ invited humanity into a relationship with himself, and through him to the Father, meaning that refusal does not result in punishment but is itself its own punishment, separation from God being hell. God thus appears to overcome his own ambivalence about the power he has over human beings. Burt claims the Christian bible presents us with a God whose only power is his ability to destroy us, but even then limits are placed on this power by the promise of the rainbow-function of authority. Burt suggests, however, that the gospel writers were skeptical as to whether Jesus was strong enough to protect humanity from such a fate. All this may seem unusual reflections for a professor of law and unrelated to the central problems of political theory, but here Burt pivots away from exegesis and toward political life. The core of Burt’s argument is that modern theory predicates itself on notions of perfect justice, and such notions are destructive of political order rather than conducive to it. Modern theorists, Burt claims, strive for perfect harmony in the relationship between the ruler and the ruled, and such striving makes no allowance for weakness, vulnerability, instability, or error. The persistence of these elements means we ought to have a polity that stresses mutual dependence and forgiveness between ruler and ruled rather than perfect justice, for those who seek it will destroy the world in the attempt. In chapter 13 Burt relates this thesis to the behavior of the Supreme Court by focusing on Brown v. Board of Education, Cooper v. Aaron, Roe v. Wade, and the Nixon Tapes cases. The key comparison involves whether the Court sees itself in a command-and-obey mode, as it did in Cooper and Roe, or whether it sees itself in a “rainbow” mode, as it did in Brown. The former two exemplify judicial power grounded in arrogance but also a sense of its institutional vulnerability. In Brown, however, the Court confronted the practical power of government not by [*106] attempting to create perfect justice through coercive means, but instead by appeal to moral norms, by acknowledging “a shared sense of justice on behalf of a vulnerable petitioner complaining of public abuse” (p.314). In short, in Cooper the Court sees itself as God in the book of Job, and in Brown as Job himself. The central role of the Court, then, is to use its rulings as a way of commanding attention to grievances and reminding authority of its role in repairing broken relationships. It beseeches both parties to engage in mutual respect, something it utterly ignored in Roe by focusing almost exclusively on the rights of the physician. The Court must operate within the context of a shared social sense of the norms regulating the imperfection of human relations and realize that it cannot command reparation but only remind the parties of their obligations to and need for one another. It must, in other words, articulate social norms and attempt to get one of the parties to acknowledge its violation of the trust required to sustain these norms and the relationships they enfold. The Court missed this opportunity in the Nixon Tapes case because by jumping the gun on the impeachment proceedings it communicated to Congress that only Court could be trusted to do justice, and Congress couldn’t. As an aside, I’d argue that much the same could be said of the Court’s ruling in Bush v. Gore. The book concludes with a lovely meditation on the three parables in Luke 15. The connective tissue, Burt shows, emerges in the need to attain harmony after a relationship has been breached. How do we struggle with our own guilt and inability to reconcile? How do we account for justice in a world where none are just? The only way to experience perfect justice, Job teaches us, would be to isolate ourselves from all relationships. To be human, however, is to be in a relationship, and thus to be vulnerable. Like God, we must learn to settle for less, and thus expect less from law and politics, but perhaps more from each other. Those theologically inclined may find Burt’s incisive reading offset by heresy: patripassianism and Arianism. Secular scholars and apologists for modernity, on the other hand, will be even more off-put by the book’s premise: that a Biblically-based theory of politics provides for a more stable and more just order than that provided by modern theory, especially in the latter’s privatization of belief. As such, the book marks an interesting contribution to the growing literature in political theology. U.S. v. Nixon 418 U.S. 683 (1974). Copyright 2013 by the Author, Jeffrey Polet.